THIS IS THE PROPAGANDA WE MUST VOTE AWAY SCOTLAND – PLEASE SHARE!!! I added this as a picture but I don’t think I explained what it was I saw and only one person has so far. Look at the time the BBC changed the page, the updated it 5 MINUTES after publishing it! See the first one was the BBC saying “Being Scottish” is a thing to be, a way of being! They then rushed to change the headline to “UK” Ebola nurse! So people all over Scotland were from the UK. See this is the propaganda right here. Make no mistake this isn’t just some wrong worded article by the BBC. They knew within 5 minutes they may upset their London masters. Saying “Scot’s Ebola Nurse” would give Scottish people a passionate feeling of being Scottish, so they edited that out. Guys and Gal’s IT’S THE SMALL DETAIL we must look at. We have to take this for EXACTLY what this was by BBC Scotland. Look, it’s right there. They gave “Scottish People” and deleted them, you and I, to being from the “UK” They nearly gave Scotland, you and I and identity. See it now? I am glad the woman pulled through, all said, that was the most important thing here, she got better from Ebola. But guys, SEE! This is what they do. LOOK AT IT! Share it, share the meaning. We must see it now. This is UTTER PROPAGANDA against Scotland. Not some ‘Stupid mi-type’ Wake up people. We MUST vote SNP or Yes people into Hollyrood or we will forever have an identity places upon us from the very people we pay and before we know, like the USA we are living in a semi-Fascist state. KEEP LOOKING, THE SMALL DETAIL SCOTLAND. DON’T BE FOOLED! It’s the small detail! Share this, share the meaning, please guys!! This should come as surprise to nobody, but now it’s official, the BBC did hinder the democratic process in the referendum. Many may know this, many may not know this. If we were in any doubt about paying a TV Licence to the BBC who lied and threw propaganda at us during the lead up to the Referendum, we know 100% now, the BBC were lying and Propaganda was in play, this is 100% official now. The BBC’s former Business Editor, Paul Mason, has launched a stinging attack on the British state broadcaster over its coverage of the Scottish independence campaign. EDINBURGH, September 13 (RIA Novosti), Mark Hirst – The BBC’s former Business Editor, Paul Mason, has launched a stinging attack on the British state broadcaster over its coverage of the Scottish independence campaign. Mason, who worked for the BBC for 12 years before becoming Economics Editor at Channel 4 News in 2013, wrote on his Facebook page that, “Not since Iraq have I seen BBC News working at propaganda strength like this. So glad I’m out of there.” Later in an official blog written for Channel 4 News Mason again attacked coverage of Deutsche Bank’s warnings that an independent Scotland would lead to a 1930″s economic depression in Scotland. In an article, published Saturday and titled “Deutsche’s ‘Wall Street Crash’ Prediction Goes Ueber Alles On the Airwaves,” Mason highlighted previous “warnings of doom” by the same bank, but which were ignored by the German government, over the consequences of introducing a minimum wage for German workers. Mason concludes that Deutsche Bank’s warnings, issued by its Head of Strategy, David Folkerts-Landau, are nothing more than an opinion and “open to debate.” “As I write this I hear the words ‘Deutsche… Scotland… Wall Street Crash’ are being read out by newsreaders on our venerable state broadcaster,” Mason added. “Other opinions are available.” Edward McDowell, a former Risk Manager at Lloyds Banking Group told RIA Novosti that the warnings issued by Deutsche Bank were “misleading.” “They do not take account of Scotland’s strong fiscal position or well established institutions and I believe is another example of misleading information,” McDowell said. Deutsche Bank also received criticism from one of its former senior managers. “I think people need to remember that this is the bank that failed to forecast the crash in 2008 and what they are saying now is preposterous,” said Ian Blackford who previously ran Deutsche Bank’s operations in Scotland and The Netherlands. “RBS and others have said there is no risk to jobs or investment in Scotland. It is about moving the brass plates and the fact is that this all about the UK government’s panic over the real possibility of it losing the union,” Blackford added. This is the full show from Glasgow from today, 22nd November 2014, I add a date because I know I will have to return this article someday soon. I ask you one question Scotland “Do you want Scotland to be a independent nation” If the answer is yes I ask you please help me and join this link above. The undertaking by the people who started Scot2Scot have a page for EVERY area covering the lowlands, highlands and islands of Scotland. I ask also “Define how proud you are of your Country and fellow Scottish friends” I can answer for me. I am very proud of my country and YOU. You are part of the same movement as I. You may be from foreign shores and I know some friends from out with Scotland who desire Scotland to be free. Scotland – We can’t be scared nor selfish, don’t be the Worlds joke! THIS IMAGE BLOWS MY MIND. SCOTLAND HAS WOKE UP, WE WANT FREE AND WE ARE TAKING WESTMINSTER TO TASK, WE ARE COMING! POLICE have launched an investigation into the alleged theft of documents, including unused referendum ballot papers, in East Lothian. A video posted on Facebook shows a person with the papers, which it is claimed were found beside a bin outside East Lothian Council’s headquarters in Haddington. But the council has rejected the claim and said the papers were removed from a storage room. Under election rules, unused ballot papers from any election or referendum have to be counted and retained for a year. East Lothian chief executive and returning officer Angela Leitch said the matter was “extremely concerning” and both the police and the council were looking into it. They say Labour are dead in Scotland, how dead? The protest aimed to highlight the plight of the most vulnerable in society and featured a food bank collection. There was a strong police presence outside the Grand Central Hotel in Glasgow as Labour figures arrived for the dinner. A line of police faced protesters waving placards with messages such as “Labour the Judas party – enjoy your last supper”, “Taxi for Labour” and “Labour, your tea’s oot in May”. The demonstrators shouted slogans such as “Red Tories out”. Jim Murphy MP, one of three candidates for the Scottish Labour party leadership following the resignation of Johann Lamont, was one of the senior figures to use the hotel’s main entrance. 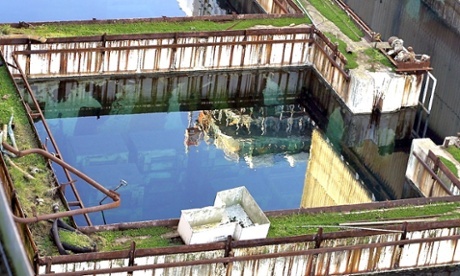 A pond containing spent nuclear fuel rods at Sellafield. Sellafield nuclear plant is on the South West of Scotland. This is why Scotland wanted this out of our Country. This has the potential to kill millions. When will we learn? 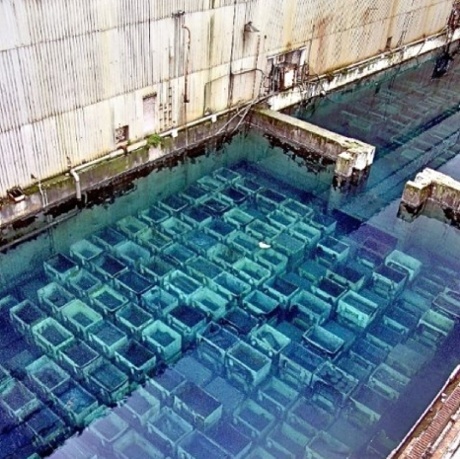 The storage ponds at Sellafield, as shown in this photograph sent to The Ecologist, have been called ‘disgracefully degraded’ by the executive director of the Institute for Resource and Security Studies. The images, taken over a period seven years and leaked via a local nuclear watchdog group to the Ecologist, are said to show two ponds that were commissioned in 1952 and used until the mid-1970s as short-term storage for spent fuel until it could be reprocessed, producing plutonium for military use. One is open to the elements. 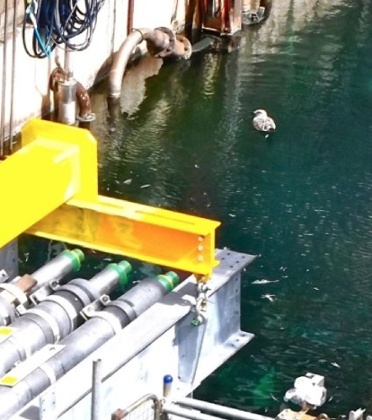 This photograph sent to The Ecologist shows a seagull bathing in the water of a storage pond used to hold radioactive material. The government is paying private companies £1.7bn a year to decommission ageing buildings at Sellafield. “It is urgent that we clean up these ponds [but] it will be decades before they are cleaned up. Before that, a lot of other work has to be done. We are aiming to get them to the point where they are in a condition where the waste can be taken out of them,” said a Sellafield spokesman. According to Large, who gave evidence to the House of Commons environment committee investigation into nuclear safety in 1986, the ponds were abandoned after they were overwhelmed with spent fuel during the 1974 miners’ strike when Britain was put on a three-day working week by prime minister Edward Heath. 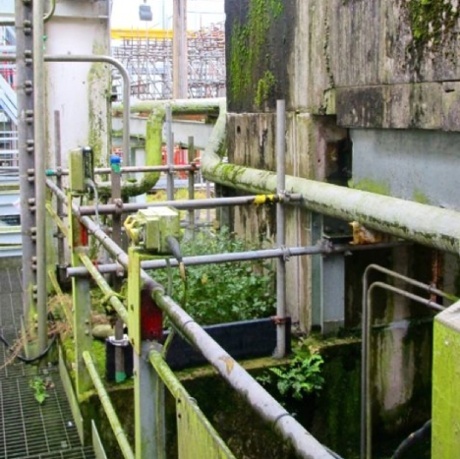 This photograph sent to The Ecologist shows weeds growing around derelict machinery within the Sellafield facility. “In order the ‘keep the lights on’, the UK’s fleet of nuclear power stations were run at full tilt, producing high volumes of spent fuel that the Sellafield reprocessing facilities were unable to keep up with. During the three-day week they powered up the Magnox reactors to maximum, and so much fuel was coming into Sellafield that it overwhelmed the line, and stayed in the pool too long,” Large told the Ecologist. Alex Salmond has hinted at another referendum on Scottish independence taking place as he threatened to exact “revenge” if pledges promised by the government are not fulfilled. As MPs in the House of Commons debated the promise of more powers for Scotland, the SNP leader accused David Cameron of “reneging” on pledges promised in the run up to the historic vote and warned there would be consequences if the No parties fail to deliver more powers for Scotland. The debate erupted into a heated clash between William Hague and Former Prime Minister Gordon Brown, the latter of whom argued that “crude” Tory plans risked undermining the UK in the wake of the referendum. Salmond’s comments also came as a senior Labour MP warned that the refusal of some supporters of independence to accept the result of the 55% to 45% ‘No’ vote will “poison” politics in Scotland. Glasgow South West MP Iain Davidson, the chairman of the Commons Scotland committee, told MPs today that politicians and voters should “accept that there was a clear and decisive result”. “It appears that no form of devolution will satisfy those who are in favour of separation,” he said. “We ares starting to see not just an unhappiness about the result but an actual rejection of the result. A myth of betrayal is being put forward.” Davidson said there was now a “grievance a day mentality” on the part of the SNP and supporters of the unsuccessful ‘Yes’ campaign. “That is going to poison, potentially, Scottish politics,” he said. But Salmond has insisted that Cameron is set on letting down Scottish nationalists. But Leader of the House of Commons William Hague said Salmond was “almost looking for and hoping for some sense of betrayal”. The Tory minister told Today: “Let it be very clear that every commitment made by not only the Conservative but Labour and Liberal Democrat parties about what would happen if the result of the Scottish referendum was No, every commitment has so far been kept and will be. “We have said, the Prime Minister and I have said, that those things should go in tandem. But they are not tied in the sense that one is dependent on the other. “The commitments to Scotland are unconditional and will go ahead – this is an absolute 100% clear commitment that will go ahead whatever we decide or don’t decide about England. “But it is our view that fairness to the whole of the UK means the party should also agree on the same timetable the consequences for Scottish MPs voting on English matters. “If they can’t, then of course it will be a matter we all debate in the general election campaign. This is a democratic country. The people will decide.” Earlier, Hague clashed with Brown, who warned “nations can collapse by accident”. Brown said excluding MPs from non-English constituencies from some votes would erode the “stability and harmony of the British constitution”. “You cannot have one UK if you have two separate classes of MP,” he said. “You cannot have representatives elected by the people who are half in and half out of the law making process.” Brown has already warned that Cameron’s plans to ban Scottish MPs from voting on English laws risk breaking the “fragile” Union. HAD NO MANDATE TO MAKE PROMISES!